Michigan Fly Fishing & Light Tackle Guided Fishing Trips on Grand Traverse Bay & the Traverse City area for Salmon, Steelhead, Trout, Carp, and Trophy Smallmouth Bass. These reports are from Jon's Guide service a Michigan fishing guide service located in South Boardman Michigan and having remote locations in Baldwin Michigan and Newaygo Michigan, providing guided fly fishing, instruction, and schools on Michigan's "Gold Coast Rivers". Fly Fishing reports for Salmon, Steelhead, Trout , Smallmouth bass & Carp. Jon's Guide Service offers Michigan guided fishing services and trips year round on many of the Midwest's finest "blue Ribbon Streams & Rivers" such as the Manistee River, Pere Marquette River, Muskegon River, Betsie river, as well as Lake Michigan, Lake Huron, and Grand Traverse Bay. Michigan River & stream based Guided Fly Fishing, Instruction, and schools offered, as well as classes on fly tying and more. Join us for a great day of "Michigan Guided Fishing." 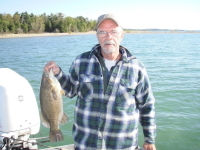 Smallmouth fishing in Grand Traverse Bay has moved to the deeper weed beds and drops. Most fish are in 15' - 35' of water. Water temps are a bit colder than normal, and we should see fish move shallow again a little early to most seasons. Look for September to bring fish shallow again! Late May and June is the time for fly fisherman to fish the bay. Large groups of pre-spawn fish, and monster smallies on deep beds is the game! 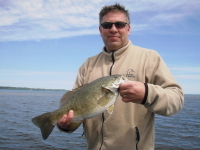 Although there are many places on the Great Lakes to fish smallmouth bass, Grand Traverse Bay has to rank near the top for trophy smallmouth fishing. Last season 8lbs was our largest fish! lake trout fishing on streamers in the shallows in May! Taking bookings for the 2014 season. Best dates are late May and early June, and these dates fill fast! 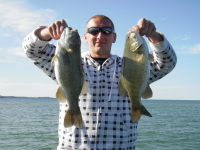 Smallmouth fishing in Grand Traverse Bay Ranked top 10 in USA! 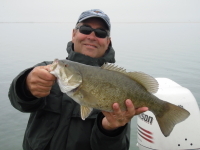 Jon's Guide Service offers smallmouth fishing on Grand Traverse Bay, and many of the great inland lakes such as Tourch Lake, Long Lake, Green and Duck lake, Elk lake, and Skegemog Lake . 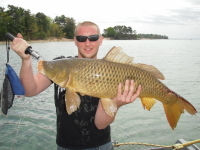 Guided Fishing out of Traverse City Michigan located on the banks of Lake Michigan and Grand Traverse Bay. Guided Michigan Smallmouth Bass Fishing Grand Traverse Bay! 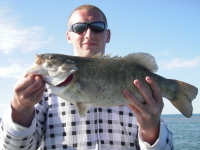 Grand Traverse Bay is listed as one of the top 10 places in the country for smallmouth fishing. Guided fly fishing and light tackle trips are offered. June is the best month of the year for smallies on a fly, as fish move shallow to spawn. Currently the smallmouth are in pre-spawn mode, grouping along deep drops in large groups getting ready for the run shallow to spawn. look at these fish moving shallow in late May and early June and for the fishing to be red hot for about 2 weeks. After the spawn, look for smallies to stage in smaller groups in water 12-15' along th deep drops, working the grasses for crayfish, baitfish, and gobies. Fishing on Grand Traverse Bay stays good to great untill later July when fish start to go deep as deep grasses and cover become alive with warmer water. Taking bookings! 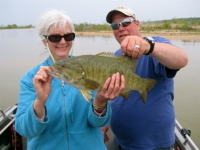 2014 Guided Smallmouth Bass Fishing - Book today!